Linwood Rumney's poetry has appeared in Quercus Review, Cold Mountain Review, and The Aurorean, among others. He teaches writing in Boston, where he is an MFA candidate at Emerson College. 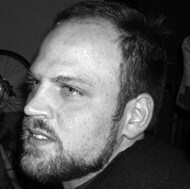 He recently completed a stint as the poetry editor of Redivider and is the 2010 recipient of the fellowship in poetry from the Writers' Room of Boston. with the bitter perfume of the abandoned earth.